Remeber a time in your life when you were betrayed by someone you loved, trusted, and gave your life to, who let you down in the worst way. Such is the case for a 7 Years-old Cairn Terrier - Mix pup named NICHOLAS, who makes his new life at the OC Animal Care in Orange, CA. 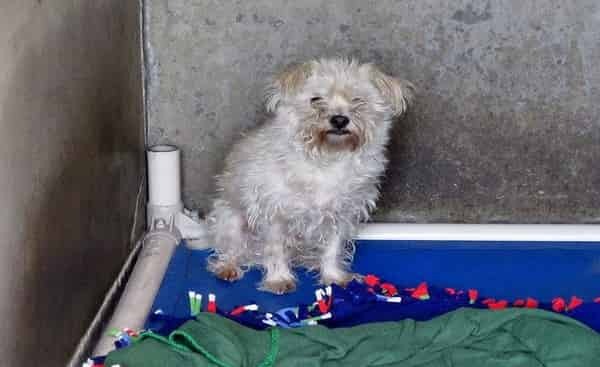 OC Animal Care, a place where so many dogs and cats languish behind, facing uncertain futures, is not the place one would wish on their own worst enemies. That’s because the animals living in the facility are given just a few weeks, and in certain cases, only a few days to find forever families, before the unthinkable happens: euthanasia. 4 Responses to "Nicholas is the little cairn terrier mix that nobody wants, terrified pup hanging on death row"
This is Coco you are speaking of correct? Space adopted 11/19/17 & now named "Dimples"
By the way, dogs at OCAC are given way more than a few weeks to get adopted. Some are there for months. And, if there is no adoption interest after awhile, they are still given more time to go to rescue. I wish you would post OCAC dogs who are truly on the euth list and not just the ones that are available to adopt. We have a Facebook group for that if you're interested. Also, we will post on their AFA threads (I know you saw the one for Nicholas) if a dog is euth listed. Nicholas came in on 11/04/17 with owner info. which means they had to hold him for 7 (maybe 10) days. He was adopted on 11/19/17 - so he was only at the shelter for 15 days, most of that time on hold for his owner. He was never on 'death row', never in any danger of being euthanized. Nice reporting of the facts.